David was never the underdog. The hidden lesson in the legend. So turns out we have the whole ‘David and Goliath’ story wrong. This story is firmly embedded in the collective consciousness. The Jewish army is facing off against the Philistines. They are both entrenched in their positions on opposing hills, in a stalemate. And so the Philistines send over their champion fighter. Apparently there was a tradition of settling these things with one-on-one combat. And so they lead out Goliath – a giant of a man, standing head and shoulders above everyone else. In glistening armour, he is a terrifying spectacle. No one is the Jewish army is willing to fight him. But David is. David is a lowly shepherd boy, and he offers to go into battle against the giant for his people. The king reluctantly accepts. He offers his own armour to the boy, but he refuses. And so David meets Goliath on the battle field. No one thinks David will win, but he takes out his slingshot and sends a stone straight between the giants eyes. Goliath keels over, at which point David runs over and cuts off his head. Now this is often told as the classic underdog tale. The lesson is that miracles can happen when God is on your side. But this might not be quite right. 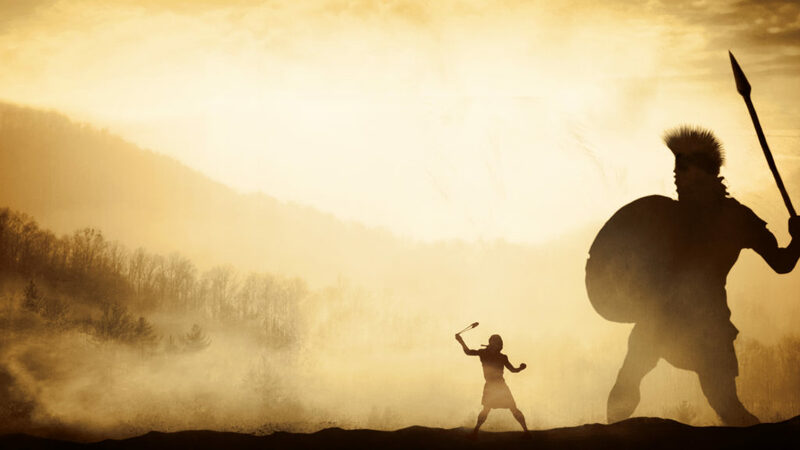 Some historians think that Goliath was not as invincible as he seemed. He possibly suffered from gigantism, one of the side effects of which is poor eyesight. He is ‘led out by the hand’, because he just can’t see that well. At the same time, David’s slingshot is not a kid’s toy. He was an expert in its use because he had been using one to defend his flock from wolves and lions all his life. The slingshot was a common weapon of war. All armies of the time also had an artillery – composing of archers and men with slingshots. The men who used them became very skilful with them. There are reports that the best slingshot users could bring down birds in mid flight. With the right stones, a slingshot was the equivalent of a 45mm pistol. And so now the situation is flipped on it’s head. Goliath is a lumbering giant, weighed down by his armour, and poor of sight. David is a nimble young boy with a deadly range weapon in his hands. Goliath doesn’t stand a chance. And so I think the lesson here is not that sometimes God smiles on the underdog. It’s about picking the right strategy for the right situation. Everyone assumed that the Jewish army would send out their best infantry man to meet Goliath. But there’s no rule that it had to be an infantry man. And David recognised that he had a strategic advantage over Goliath. Sending David in was the right strategic choice. And so I think the lesson that this story sends down through history is invest in your skills, believe in yourself, and be intelligent with your choice of strategy. Don’t do something because everyone expects it. Go to the right tools for the right job. Intelligent strategy trumps brute force every time. Now, isn’t that a little more empowering?